Linda Rising is sought after as a coach, speaker, and author on change, connecting the latest neuroscience with software development and leadership, and supporting positive transformation in organizations. 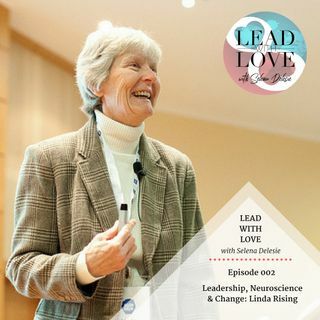 Linda has extensively studied the connection between children, mindset, and how to improve our own mindset at work. Her articles and books on navigating fear and change are powerful reminders on how our feelings and beliefs drive the outcomes we experience. Our conversation explores these ... See More and other topics, including the destructive force of unhappiness for any business or relationship, the power of appreciation to achieve higher performance, and three steps to achieve real, lasting change. You’ll also hear how Linda uses food as a connecting force for creating safety and trust among people. Linda’s care, humour, and wisdom will benefit every leader. Her practical inspiration will help you amplify your own leadership, from the heart. Linda Rising is an independent consultant who lives near Nashville, Tennessee. Linda has a Ph.D. from Arizona State University in the area of object-based design metrics. Her background includes university teaching as well as work in industry in telecommunications, avionics, and tactical weapons systems. Linda is an internationally known presenter on topics related to agile development, patterns, retrospectives, the change process, and the connection between the latest neuroscience and software development. She is the author of numerous articles and several books. The latest, More Fearless Change, co-authored with Mary Lynn Manns. Learn more at: www.lindarising.org.